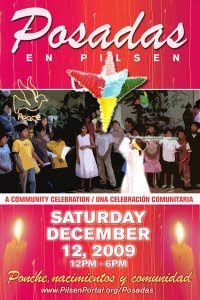 Chicagoans can get a jump on this year’s Holiday celebrations and the city’s winter festival season at the first ever Posadas en Pilsen festival on Saturday, December 12, 2009. The Posadas en Pilsen festival will be a daylong event that will take place from 5:00 a.m. to 7:00 p.m. along 18th Street and extending into some arterial streets in Pilsen, the heart of Chicago’s Mexican community. The event is being organized by the Pilsen Commerce Roundtable, a group of small businesses united to expand and strengthen commerce in Pilsen. There will be many opportunities throughout the day for people to join in the day’s festivities. The day’s activities begin at 5:00 a.m. with the celebration of La Virgen de Guadalupe, patron saint to Mexico, at the neighboring churches with music and mass, attendees will be given the opportunity to eat a traditional Mexican breakfasts at participating restaurants and cafes. The highlight of the event is a walking tour along 18th Street, the main commercial corridor in Pilsen, beginning at noon. Attendees will then have the opportunity to visit 25 participating businesses and sample traditional Ponche, a Mexican hot beverage consisting of sugar cane, fruits, and cinnamon, all the while judging nativity scenes either hand crafted by local artists or by the business. There will be awards given to both the best Ponche and Nativity Scene and will all culminate at an outdoor festival at Plaza Tenochtitlan on the intersection of 18th Street and Blue Island Ave. where attendees will be given a complimentary Aguinaldo, traditional gift-bag given to the attendees who make the pilgrimage throughout Pilsen filled with various traditional candies and fruits, also the children will be given the opportunity to participate in breaking of a piñata that same evening. “We wanted to create this event for Pilsen because it’s one of Chicago’s largest Mexican communities, and the Posada tradition is very important to the Mexican and Latino community” said Hector Saldana, one of the event’s organizers. A variety of businesses from Pilsen have signed up to participate and compete including restaurants, cafes, galleries and other local business. 1626 S. Blue Island Ave.